I have posted a couple of times now about ex-tropical cyclone (Lee Harvey) Oswald and how he got my attention recently. A few hours ago – Thursday evening – we regained our internet access, having been without it since Monday morning. We were without power, telephone and mobile phone since Sunday morning. But, inconvenient as these events were, especially when there is disability and a chronic medical condition to deal with, they are nothing compared to the loss or damage of houses and even loss of life. And I believe there are people who are still without power and basic services. Oswald sure did a number on the East Coast, surprisingly all the way down to Sydney and beyond because of an upper monsoonal trough thingy that kept feeding water and energy into the beast way past its standard use-by date. In the few days it took for the system to pass over us, we had almost 500mm of rain and lots of high winds. Not as much as some, but more than enough. I was pretty well prepared, but not as well as I plan to be next time. We are working up a new, improved version of storm preparation because it seems we are going to have more, not less of these ‘extreme’ events in the years and decades to come. 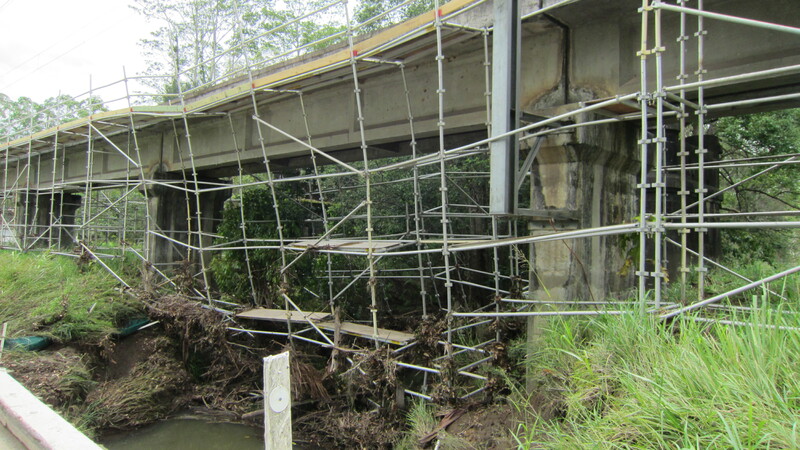 In the meantime, here is a picture of bent and twisted scaffolding that was put up across the bridge over the Mooloolah River here a couple of days B.O. (Before Oswald) by trusting souls who thought the dry sandy flat bit was a garden bed rather than a river bed. It very quickly became a river again on Sunday and laughed ha-ha in the face of their puny steel tubes and bars. ~ by Garry on February 1, 2013. Flooding in Queensland and the East coast of Australia made US national news here on Tuesday – that is a rarity – so I knew it had to be intense. sadly, there are still people isolated and distressed in Nth QLD and Nthn NSW. It has been moderate compared to 2011, but still devastating for lots of people.